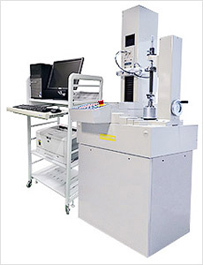 Database supporting LAN has been provided The CLP-35 and the CLP-65 are state-of-the-art CNC full automatic gear measuring machines dedicated to the measurement accuracy of gears being used under high loads, such as transmission gears in vehicles. 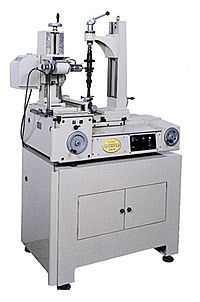 With this instrument, the profile, lead, pitch, and runout of gear can be measured quickly and accurately. This instrument supports a LAN environment so that data can be controlled, browsed, and processed on the network on a real-time basis. 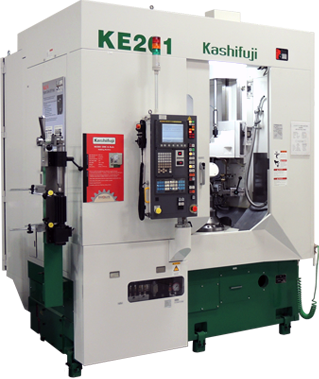 This is an outcome of our technology developing the leading CNC gear measuring machines in the world. 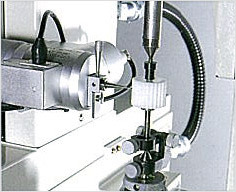 CLP-15S (Maximum measurement diameter: 150mm) CLP - 15S - CNC gear measuring instruments - enables quick, fully automated measurement of tooth profile, lead, pitch and runout of sintered or injection molded gears used for precision instrument and electronic devices. 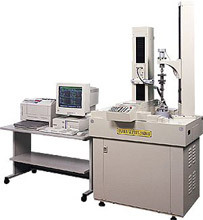 Since the system is computerized throughout from measurement to analysis of results, reliable and high-accurate measurement is realized. OSK can also provide a wide range of software to meet customer's requirement. 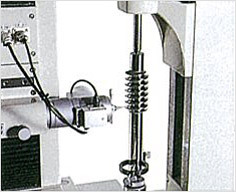 CLP-35 (Maximum measurement diameter: 350mm) / CLP-65 (Maximum measurement diameter: 650mm) CLP-35 and CLP-65 CNC gear measuring instruments enable quick, fully automated measurement of tooth profile, lead, pitch and runout of gears used for high heavy duty power transmission. 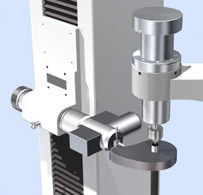 Continuous measurement of cluster gears, detail & 3D measurement of tooth surface and output with comparison between before/after heat treatment are available by means of the standard software. Up to 850mm can be measured upon request. HyB-35 (Maximum measurement diameter: 330mm) / HyB-65 (Maximum measurement diameter: 630mm) HyB - 35 and HyB - 65 perform automatic measurement of profile, lead and pitch of spiral bevel and hypoid gears of M:1 or larger. 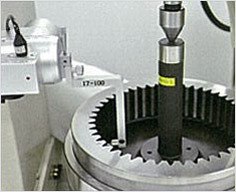 Measuring method is similar to that of parallel axis gears, therefore tooth form of hypoid gear can be checked precisely including small waviness. 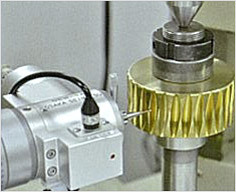 (Measurement of straight bevel gear is optional.) Just by following the guidance on the display, measurement of hypoid gear surface, data analysis and storage can be done easily. 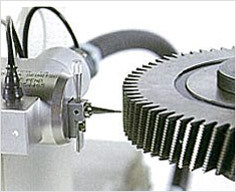 CLP-35 and CLP-65 CNC gear measuring instruments enable quick, fully automated measurement of tooth profile, lead, pitch and runout of gears used for high heavy duty power transmission. 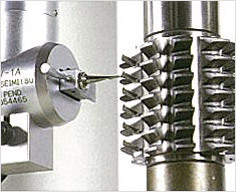 Continuous measurement of cluster gears, detail & 3D measurement of tooth surface and output with comparison between before/after heat treatment are available by means of the standard software. Up to 850mm can be measured upon request. GC-3H (Outer diameter: 10 to 350mm, Base circle disc type) GC-3H is manual operating machine for profile and lead measurement. It requires base circle disc depend on the gear dimension. 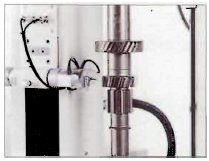 UB-2 (Module : m1 to m7) UB-2 measures runout of spur and helical gears. 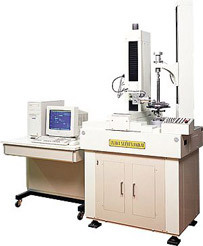 Easy-to-use and high reliability results in much use in the plants and laboratories worldwide. 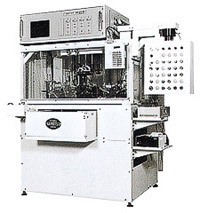 Automatic Profile Machine Design/Production Modifying CLP-35 and CLP-65 - CNC gear measuring instruments, OSK manufactures the Profile Measuring Instrument for cylindrical parts with special profile, i.e. cylindrical cam, ball spline groove, rotor of rotary engine by customer's request. 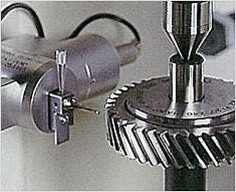 AGY measures nick, runout and size of pinion with hole and ring gear automatically. Adding optional equipment including burnishing machine, washing device and selecting device, our products enjoy good reputation as they can adapt flexibly to new line even after running caused by change of design whenever required. AGM (For shaft gears) AGM measures nick, runout and size of counter shaft gears. 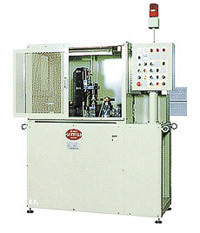 Burnishing Machine This is optional equipment for automatic gear selecting machine AGY and AGM. The optimum components are selected to construct gear measuring machines and entire systems because the highest emphasis is placed on stable operation of this gear machinery. For instance, the highly durable resin Turcite is applied to the sliding surface in order to maintain high accuracy for a long time. Comfortable operability equivalent to a PC has been achieved by supporting Windows as the OS for the system. Availability of peripheral devices has been expanded. Productivity by data processing shall be improved drastically. The speed of gear measurement has been improved further by changing the power transmission method from the conventional combination of a worm and a worm wheel to a new combination of a gear box and a ball screw. On the other hand, the cycle time has been shortened without deterioration of accuracy by revising the measuring operation. The Service Division has newly been established to recover the system as quickly as possible in case of an emergency. This instrument has been designed where components of the interfaces and peripheral devices can be replaced unit by unit, so that operation can be resumed with minimum replacement work in case of an emergency.